the gold rush. He wasn’t after the gold in the ground. As a baker, he was more interested in the gold in the miners’ pockets. After his death in 1887, his wife, Louise, continued to run the business. Today their sourdough is famous. An interesting bit of trivia – During the fire which followed the 1906 earthquake, Louise ran inside the burning bakery, threw the starter into a wooden bucket and ran out. The bakery burned to the ground, but the precious starter was saved. Boudin’s states their starter has been replenished every day, without interruption, for 150 years. What do you do with sourdough bread? Well, besides the obvious (Slice, butter and eat. ), it makes marvelous Stuffed French Toast. A splash of milk – I’m not good at measuring sometimes. 3 oz. cream cheese – I used reduced fat. A few drops of vanilla extract – Yeah, yeah. I’ll measure next time. 1 c. mixed berries – I used frozen blueberries, blackberries and raspberries. Cut a slice nearly through each slice of the sourdough bread. Beat together the egg, milk and cinnamon. Set aside. Mix together the cream cheese, powdered sugar and vanilla. Spread this mixture in the pocket you created in the bread slices. Dip both sides in the egg mixture and cook on a hot griddle until browned. 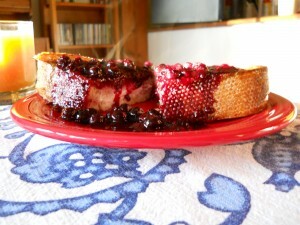 Serve with the berry sauce. It’s delish. I promise.